Summer is in full swing now that it's July, and that means sunny days spent getting bronzed poolside, at least for the lucky ones of us. For me, it mostly means work and trying to keep Lilah entertained, while squeezing in as much time as possible with Ryan. Not that I don't love those things (minus working), but summer is a whole lot different than the carefree time I had when I was a kid. It's been hard to find the time to blog, (sorry for my hiatus!) and I was just lacking inspiration. So, I redid and redesigned my blog to give it a fresh look/start, and now I'm definitely feeling inspired and super pumped to blog as much as I can. So be prepared to see a lot more posts soon! Even though this summer may not be the "summeriest" of summers, I try my best to squeeze in as much fun as I can, even if that just means going into the backyard to tan and have a popsicle while Lilah is down for a nap. 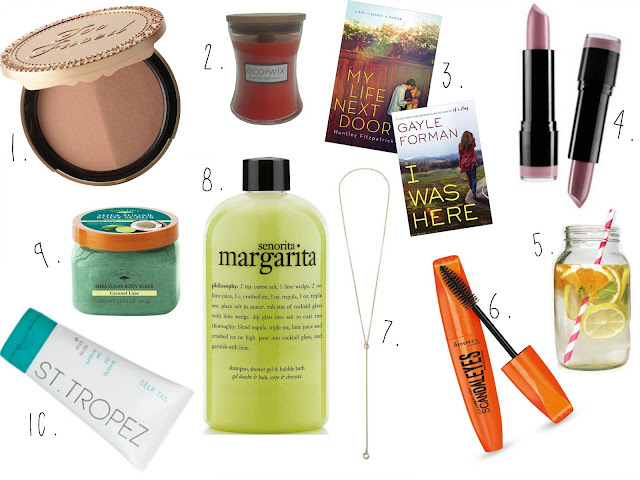 One thing that I am super excited about is the fact that I've discovered/rediscovered so many new products and things that I have been really into during this season, and they're way too good to keep to myself, so without further ado, here's 10 things that I've been loving this summer! 1. Too Faced Sun Bunny Natural Bronzer: Guys. This bronzer is EVERYTHING. Not even kidding. I didn't think I needed it since the full size was kind of pricey, but then I found a mini one and I HAD to try it. Best. Decision. Ever. It has two different, slightly shimmery (but not glittery) shades in it, and swirled together they create the most beautiful, bronze goddess summertime glow. It has a pink undertone to mimic a natural tan. It's perfect. To anyone who is into bronzers- you NEED to try it. 2. Eco Wix Wood Wick Candles: I have always loved candles, and I bet most of you do too. They just create such a peaceful, serene ambiance in any room that you light them in (not to mention how they make your room smell amazing). This summer, I have really gotten into using them at night before I go to bed while I'm relaxing. I found the Eco-Wix brand at Marshalls, and I fell in love. They are soy blend, wood wick candles which means that they crackle as they burn, and they last forever. I got one in a melon scent which is very summer appropriate. Definitely recommend!! 3. Books: I've always loved reading, and with summer here (and a really long car ride to Colorado), I finally found time to read some books. The two pictured are my most recent reads. "My Life Next Door" is more of a drama/ romance book about a girl who falls for her neighbor next door, despite the fact that her mother doesn't like his family. It was a cute, light summer read. It would be great for the beach. The other book is called "I Was Here," and it's a more serious, thriller type of book about a girl trying to piece together the reasons behind her best friend's suicide. 4/5 for both of those books. 4. NYX Extra Creamy Lipstick: I'm always one to love having color on my lips in all seasons. I purchased these lipsticks on a whim at Ulta, and I've been very pleased. They are creamy, pigmented, and lovely. I got them in the shade "Lala" and "Tea Rose." Lala is a fun, unique dark purple-y mauve color. Tea Rose is that perfect, your-lips-but-better neutral pink shade. They have a velvet-like consistency that leaves your lips feeling moisturized, and not dry. Plus they're only $3.99. Can't beat the price! 5. Fruit Infused Water: Summer where I live means VERY hot temperatures, so it's important to keep hydrated. I am not a fan of plain water, and I always feel like I have to force myself to drink it. So, my solution is to get a big water dispenser, put a variety of fruit and or herbs and spices in it, let it sit overnight, and then drink up! My favorite combination right now is apples and cinnamon. Just slice up one apple, put a couple of whole cinnamon sticks in, and enjoy! 0 calories and tastes like you're drinking an apple pie. 6. Rimmel Scandaleyes Mascara: This used to be my holy grail drugstore mascara. I stopped using it for some reason to try some other mascaras, but I recently switched back, and I swear I will never purchase a different drugstore mascara again. This mascara has a massive brush that delivers amazing volume as well as length. And since it's drugstore, it's definitely affordable. 7. Drop Necklaces: Recently, I have been loving minimalistic, dainty necklaces, especially the drop ones. I have one similar to the one pictured, and I wear it alllll the time. It goes with everything and adds a perfect extra touch to your outfit. The one I have pictured can be found here and is similar in concept to the one I have. 8. Philosophy Senorita Margarita 3-1 Shampoo, Shower Gel, and Bubble Bath: First off, this smells incredible. It's a very delicious summery scent that will transport you straight to the beach. I haven't tried it for bubble bath yet (what mom of a 9 month old has time for bubble baths? ), but as a shower gel it's wonderful. It suds up a lot, is really moisturizing, and a little goes a long way. 9. Tree Hut Coconut Lime Shea Sugar Scrub: When you're trying to maintain a good tan in the summer, exfoliation is so important. It stops your tan from becoming uneven, and especially helps if you got a little burned and are peeling. I've been loving body scrubs lately, especially this one from Tree Hut. It leaves my skin silky soft, and smells amazing. Plus, since it's a sugar scrub it won't sting your legs after shaving like a salt scrub more. 10. St. Tropez Self Tan Gel: If you want to be tanner without baking in the sun or resorting to a tanning bed this summer, then a good self tanner is a must. I love the tanning gel from St. Tropez, which can be difficult to find (I got mine from Costco), but I know that all of their tanning products get awesome reviews. What I love about their tanners is that they definitely have more of a green undertone instead of a orange one, which results in a more natural tan. Well, that's it for now! I hope that y'all try some of the things I listed and love them too! Summer is such a fun time to try new things, from different products to going to new places.